Termites are as fascinating as they are destructive. Termite queens have the longest lifespan of any insect alive. Termites cause billions of dollars in damage every year in the United States alone. They consume cellulose, the fibrous compound that serves as an important component in the cell wall of green plants. Unfortunately, wood is comprised of about 40-50% cellulose, and that makes your home a potential prime target for the hungry hunters. Termite infestations are often unnoticeable, causing significant damage to the structural integrity of your home or business for years before making their presence known. For this reason, being proactive is your best defense and could prevent costly and untimely remediations. Store firewood, mulch and wood chips away from your home or business and remove dead trees from your property. Address areas where water may pool around the foundation or roof or humidity issues throughout your home. Inspect and fix any leaky plumbing or air conditioner condensation lines which might provide a constant drip. Discard or relocate any extra or unneeded cellulose materials from your basement or crawlspace. This includes wallpaper, books, paper, cardboard boxes, garden mulch, drywall, building materials and furniture. Seal up entry points around water and gas lines and cracks in exterior wood to prevent access. Keep shrubbery near your building trimmed to allow better airflow and quicker drying. The best time to prevent termites from damaging your home or business is before they invade; otherwise, you could end up with an undesirable infestation and costly repairs. Wheeler Exterminating offers termite control services by registered/certified technicians in Kinston, Goldsboro, Greenville, New Bern and all of Eastern North Carolina. We offer both residential and commercial termite services to keep these busy pests from damaging your home or business! Call today to schedule one-time or recurring termite services for your home or business. Termites are wood-destroying insects with six legs (three pair on each side of the thorax). Their presence dates back to the dinosaurs. Termites love to eat wet, moldy wood and they build their nests in the ground and in walls. 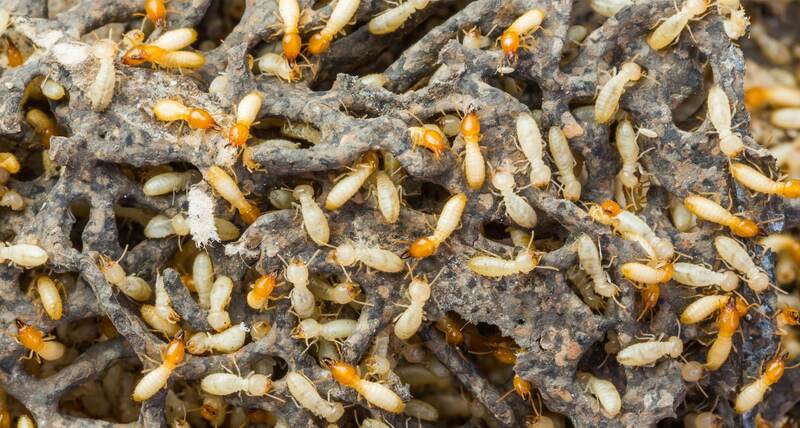 Worker termites are small, creamy white insects. They are the most numerous and the cause all of termite damage. Termites are often confused with flying ants. During early spring you may see termite swarms. If a homeowner has mud tubes on the wall of the home, an active termite infestation may exist. If you notice a termite swarm, contact a licensed termite control professional as soon as possible to schedule a termite inspection today. Termites eat 24 hours a day, seven days a week. In fact, the NPMA estimates that termites cause $5 billion in property damage in the US each year.